The story, or the seeds for it at least, began years ago, I suppose, back when I fought fires during summer vacations while attending college. Before then, I had seen forest fires on television and on film, but it soon became apparent after experiencing a few in person as a firefighter how poorly media conveys the jolting reality of the heat, smoke, flames and fear that encompass a raging fire. Writing, too, has its shortcomings, but I think of all the ways to communicate, writing's wonderful ability to allow the reader's imagination to participate in the action does best in bringing one closest to actually being there. 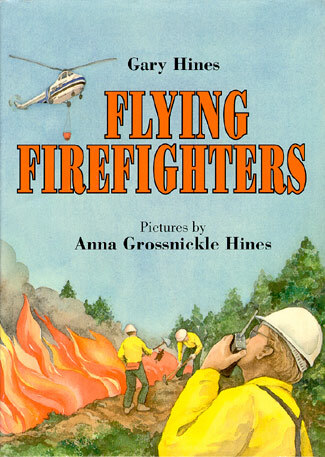 The illustrations for Flying Firefighters were a challenge to do...mostly because of the fire. Smoke and flames are always moving...and that movement needed to be captured in the pictures. When the editor, Dorothy Briley, called to tell Gary that Clarion wanted to publish the book, she was only considering me as the illustrator. While she thought it would be nice to have a husband wife team, the most important thing was to have a good book. I was not too crazy about the idea of drawing helicopters, but I too liked the idea of doing a book with Gary. Dorothy asked me if I would make the pictures energetic and do them with great enthusiasm and I agreed to try. Fortunately Gary had lots of photographs. His first idea had been to write a non-fiction photo essay book and he had taken his camera while doing his research. That helped a lot. He had pictures of firefighters in their uniforms, at work and at their barracks. He had pictures of helicopters from every angle, and of forests and fires. Unfortunately, the pictures were all black and white. I had to go to books to get the color of the fire. A brochure I picked up in Yellowstone National Park was most helpful. Ages 5-8. A "helitack" crew is summoned by radio to fight a forest fire: The present-tense drama of this picture book will hold children with its fast-paced action and exciting facts. In a long note at the end, Hines talks about forest fires in general, including how they start and whether they should ever be allowed to burn and take their course. But the story, with terse words and lively double-page-spread watercolors, has the immediacy of a single incident. Once they hear the radio dispatch, the crew spring into their fire-fighting clothes and take off in the helicopter with rotors turning and giant blades chopping the air. They sight the smoke and find the source of the fire. They work to control it from the ground and with huge buckets of water from the air until the ground crew gets there and the helitack crew can finally rest. Kids will enjoy the account of brave people at work and imagine themselves there: "Copter Five-One-Seven . . . Reported fire . . . Please respond." When a pine tree is hit by lightning, firefighters arrive in a helicopter to put out the fire. Less a story than a fictionalized narrative relating the duties of a helitack crew, the informative and clearly written text is served well by the color illustrations. 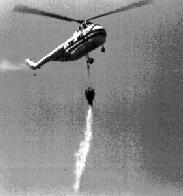 Additional facts about forest fires and firefighting are included at the end of the book. Horn Book, Copyright © 1994 The Horn Book, Inc. All rights reserved. Named a Notable Children's Trade Book for 1993 by the National Council of the Social Studies.